Replaceable double junction electrode. Automatic Temperature Compensation (ATC). Push-button three-point calibration. Microprocessor-based. Auto buffer recognition Hold function; auto-off; error messages. Certifiable to IP67 standards. The OAKTON Double Junction pHTestr 10 floats! Unique double junction electrode design and increased reference gel volume give you significantly longer electrode life, especially in harsh applications. Automatic Temperature Compensation and three point push-button calibration provide high accuracy even under varying temperature conditions. The pHTester 30 is more accurate and also displays temperature in °C. Calibration Solutions and Storage Solution sold separately. Meter kit adds: two single-use pouches of pH 4.01, pH 7.00, pH 10.0 buffer, and rinse solution, one sample jar, and sturdy carrying case. These pocket-sized testers have a replaceable single-junction sensor which can be easily switched out, allowing you to save money by using the tester body over and over again. A large LCD makes viewing measurements easy and features a three-color backlight indicating operational mode- blue for measurement, green for calibration and red for alarm condition. Additional features include hold function to lock in measurements, self-diagnostic error message, and status icons for measurement stability and low battery voltage. The IP67-rated housing features an easy-to-grip design and floats if accidentally dropped in water when sensor cap is on. Powered by four AAA batteries, the testers can operate up to 400 hours continuously. To conserve power, the unit will auto power-off after 8 minutes of nonuse. The pH testers feature up to 3-point pH calibration with NIST or US auto buffer recognition, a pH range from -2 to 16 with an accuracy of ±0.01 pH, and automatic temperature compensation. Calibration Solutions and Storage Solution sold separately. This rugged, waterproof meter is low in price but packed with features. 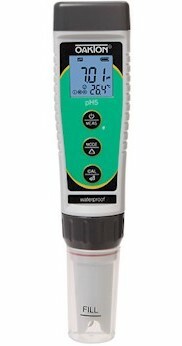 It is a high-quality pH meter that converts to an ORP meter with an inexpensive probe! The large LCD simultaneously shows pH (ATC) and temperature in °F or °C (Note: Does not read temperature in ORP mode). The internal microprocessor automatically recognizes buffer solutions when calibrating, has auto power off and a low battery indicator. 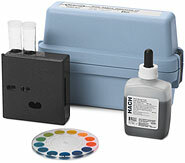 Two-point pH calibration. The rubber boot protects the meter in the field, or it can be used to mount the monitor onto a wall (screw hole on top or magnet on the back); rubber protective boot, 9V battery and instructions included. ORP electrodes sold separately. Probes are 12 mm in diameter; cabled probes have a 39 inch cable. Meter measures 4.4" x 3.1" x 1.5", weighs 0.6 lb (260 g). One-year warranty on meter only. Calibration Solutions and Storage Solution sold separately. The HI98103 Checker 1 is an economical pH tester. 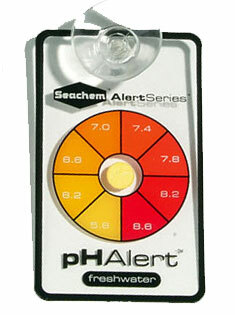 The Checker 1 provides fast and accurate pH readings. The Checker 1 is easy to calibrate, and lightweight. The Checker1 features a large easy-to read LCD and simple 2 point calibration. The Hanna Checker1 is supplied with HI1271 combination pH electrode and 2 - 1.5V batteries with 3000 hours of battery life. Calibration Solutions and Storage Solution sold separately. These easy-to-use pH pens from Hanna Industries are waterproof and will float. They feature automatic shut-off, temperature compensation, replaceable electrodes, hold function, battery level indicator, stability indicator and temperature readings in either °C or °F . 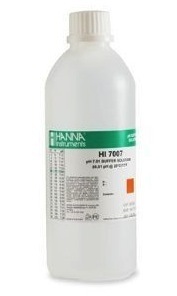 Automatic Calibration at 1 or 2 points (pH 4.10 / 7.01 / 10.01 pH). One-year warranty on pens, six-month on electrodes. Batteries Included. Caliabration Solutions and Storage Solution sold separately. 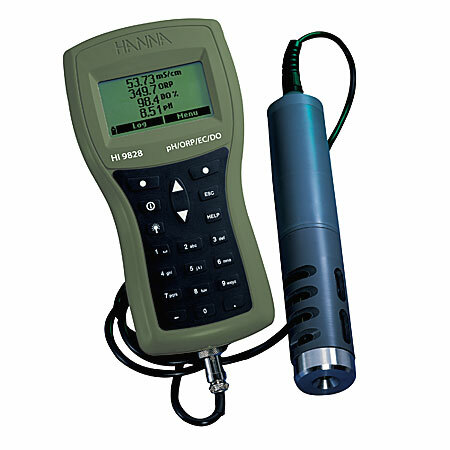 The new waterproof HI98129 & HI98130 Combo testers from Hanna are designed for high accuracy pH, EC/TDS and temperature measurements. No more switching meters to measure the pH and then the EC or TDS of a solution. At startup, Combo performs a self check then displays the remaining battery level to assure proper working condition. These testers also have a stability indicator and hold feature to prompt the user when to take the reading & freeze the display for easy and accurate recording. Calibration and temperature compensation is automatic, while the EC / TDS conversion factor and temperature coefficient factor () are user adjustable for application specific measurements. For calibration in pH, the user may choose between standard or N.I.S.T. buffer sets. The combo has a replaceable pH electrode cartridge with an extendable cloth junction as well as an EC/TDS graphite electrode, which resists contamination by salts and other substances that come in contact with the electrode. These new pH / EC / TDS / Temperature meters have a stainless steel temperature probe for faster and more precise temperature measurement. Fast, efficient, accurate and portable, the Combo pH, EC/TDS and temperature tester meets the requirements of your routine multi-measurements. HI98129 Combo; EC - 0 to 3999 uS/cm; TDS - 0 to 2000 ppm with HI73127 pH electrode, 4 x 1.5V batteries and electrode replacement tool (HI73128). HI98130 Combo; EC 0.00 to 20.00 mS/cm; 0.00 to 10.00 ppt with HI73127 pH electrode, 4 x 1.5V batteries and electrode replacement tool (HI73128). Note that calibration, storage and cleaning solutions are not included with the meter. Storage solution will be required to soak the meter prior to the first usage. 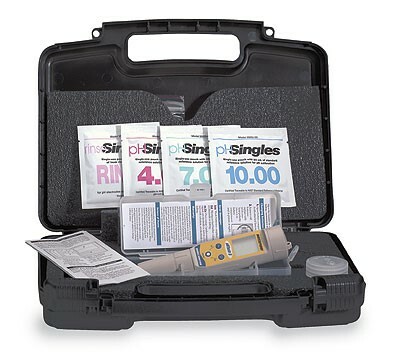 Ideal for water, wastewater, laboratory, or plant use, this multi-parameter Testr featurea long-life pH electrodes with a wide range of sample compatibility. The Tester features up to five-point pH calibration with NIST or USA autobuffer recognition. The Conductivity parameter features autoranging based on the concentration of your sample. Pin-style conductivity sensors have stainless steel electrodes for outstanding chemical resistance and durability. Replaceable sensors allow you to reuse the meter body without compromising the waterproof and dustproof protection. Other advanced features include push-button calibration, HOLD function, auto-shutoff, user-adjustable temperature coefficient, and low-battery indicator. Case, batteries, and lanyard included. Range: pH, 0.0 to 14.0; Conductivity, 0 to 1999 µS, 2.00 to 20.00 mS; Temperature, 32°F to 122°F (0°C to 50°C). Resolution: pH, 0.1; Conductivity, 1 µS, 0.01 mS; Temperature, 0.1°F (0.1°C). 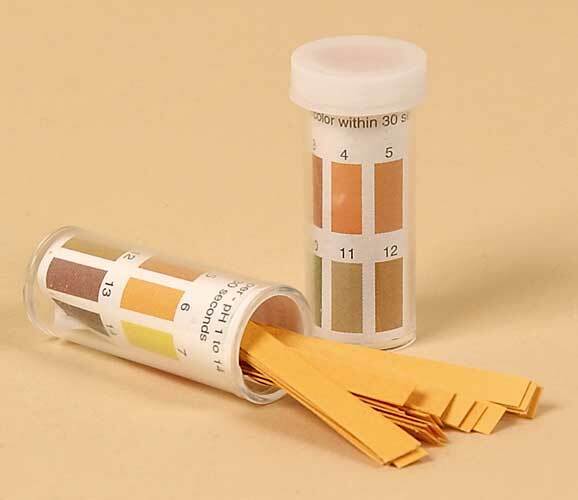 Accuracy: pH, ±0.1; Conductivity, ±1% full scale; Temperature: ±0.9°F (±0.5°C). Calibration: pH, Up to 5 points (auto-recognition); Conductivity, 2 auto, 2 manual; Temperature compensation, Automatic and manual. Conductivity temperature coefficient, 0.0 to 100%/°C. Power: 4 x 1.5 V A76 button cell (included). 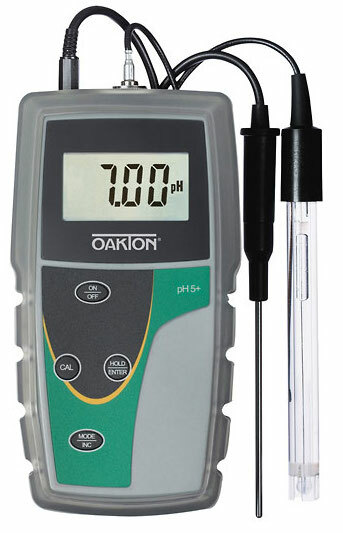 Ultimate tester for pH, conductivity, TDS, salinity, and temperature! Combine measurement capabilities of three testers in one convenient pocket-sized unit Up to 3 point pH calibration with NIST or USA auto buffer recognition. Conductivity, TDS, and salinity feature auto ranging based on the concentration of your sample Redesigned leakproof cap functions as a sample/calibration cup, hydrating cup, and stabilizing base to stand the meter upright Great for water, wastewater, laboratory or plant use, these multiparameter testers feature long-life pH electrodes with a wide range of sample compatibility. Pin-style conductivity sensors feature stainless steel electrodes for chemical resistance and durability. Replaceable sensor module saves you money by reusing the meter body. The testers bring the performance of your lab instruments out into the field. Advanced features include auto-shutoff, user-adjustable temperature coefficient, self-adjusting TDS and salinity factor, and low-battery indicator. 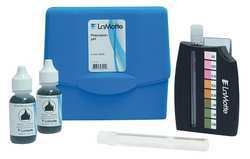 These accurate, reliable pH meters are ideal for taking routine pH and temperature measurements. Features include a large LCD, a splash-resistant membrane keypad, easy access connections for BNC electrode and temperature sensor, auto buffer recognition, three-point pH calibration, temperature readout and automatic temperature compensation, hold function, and auto-off function. The meter comes with a pH electrode and temperature probe, and they can be used with most pH and ORP electrodes with BNC connectors. Protective rubber boot included. -Auto Shut-Off: After 17 minutes. -Operating Temp. : 32°F to 122°F (0°C to 50°C). -Temp. Compensation: Automatic Temperature Compensation (ATC) Fixed 2% per °C factor. -Power: Four AAA alkaline batteries (supplied) >60 hours continuous use. -Dimensions: 5.5" x 2.7" x 1.3" unit only; 9.25" x 6.5" x 3.0" boxed. -Range: 0.00 to 14.00 pH; 0.0 to 100.0°C. 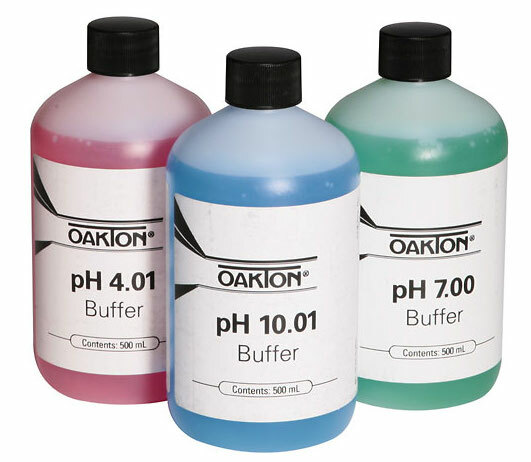 -Calibration: Up to 3 Buffer Values (pH 4.01, 7.00; 10.0). Ideal for any environment, the pH 450 meter offers an IP67-rated waterproof housing. The large, backlit LCD lets you view the main measurement simultaneously with temperature and calibration data with % slope. 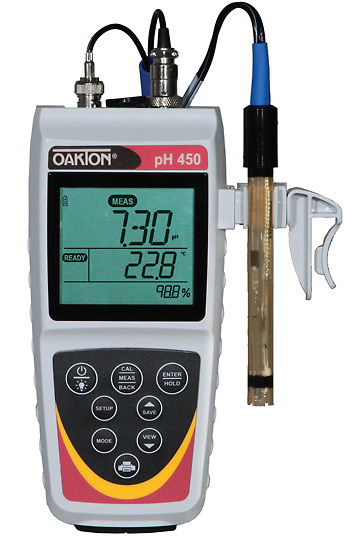 Calibrate pH and ISE with up to six points from USA, NIST, DIN, PWB and custom pH buffers. Automatic temperature compensation (ATC) ensures measurement accuracy even in fluctuating temperatures. Select temperature reading from degree C or degree F to suit your application. Meter features include ready (stability) indicator, smart averaging, hold function, calibration alarm (visible), battery-life indicator, and electrode status. Perform data logging with manual or timed collection of up to 500 data sets with real-time clock time/date stamp. -Measures: pH, ISE, mV, °C/F. -pH Range: -2.00 to 16.00 pH. 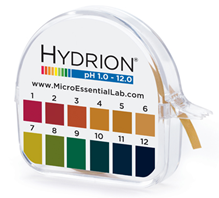 -pH Calibration: 6 points - USA, NIST, DIN, PWB, custom buffers. -Accuracy: ±0.2 mV ± 2 LSD or ±5% of reading; whichever is greater. -mV Calibration: ± 200 mV. -Ion Range: 0.0 to 19999. -Ion Accuracy: ±0.5% ful-scale (monovalent); ±1.0% full-scale (divalent). -Ion Calibration: Up to 6 points. -Temperature Range: -10.0 to 100.0 °C. -Temperature Calibration: Offset 0.1°C increments. -Memory: 500 data sets with calibration. -RS-232: Yes, and USB Optional. -Dimensions: 7-7/8" x 3-1/8" x 2-1/4" (20 x 8.3 x 5.7 cm). -Shipping weight: 1 lb. (0.5 kg). 100 strips per vial. 7/32″ wide x 2″ long in standard plastic vials. Packaged in vial with polyethylene stopper and color chart. Based on well-known spectral color changes and is sharp and clear throughout the range. Narrow strip (5/32 inches) uses micro quantities of liquid on special wet strength paper that will not tear. Each roll is 15 feet long. All kits are supplied in blue hard plastic case. Color Disc Method. Three ranges to choose from. 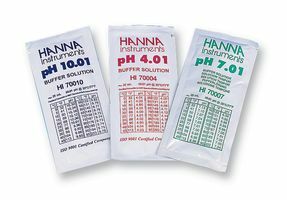 pH calibration solutions supplied in handy and cost effective 20 ml sachets. Each pouch contains sufficient solution for one calibration. The buffer solutions are individually sealed inside each sachet and protected against the ingress of light and air. Hence when you calibrate your meter in a pouch, it is like adjusting your meter in a freshly opened buffer solution. Available individually or in packages of 25. 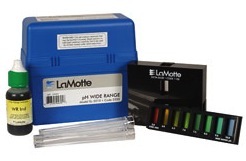 The following solutions are available for the care and maintenance of your pH meter electrode. ORPTestr 10 features a replaceable double-junction platinum electrode - ideal for checking dirty water, heavy metals, sulfides, and organics. Valox® electrode body resists most chemicals. Use these versatile instruments for applications ranging from swimming pool testing to pulp bleaching. Meter features 2 mV accuracy and a 150 mV offset. Housing allows you to attach a lanyard (included) for easy retrieval. Additional features include a hold function, auto-off function, self-diagnostic error messages, and a three-segment battery-life indicator. 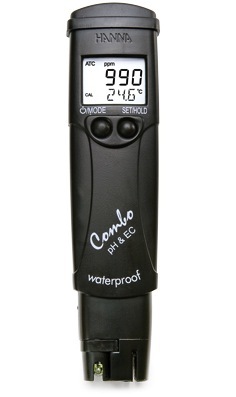 The HI98120 is a waterproof ORP and temperature handheld meter. The housing of this tester is completely sealed to protect against the intrusion of water and is also designed to float if accidentally dropped into a body of water. 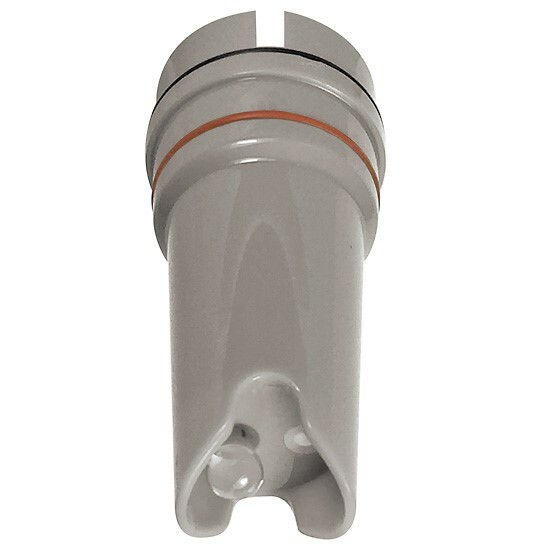 The HI73120 replaceable ORP electrode is a cartridge design with the stainless steel round connector. With this type of design there are no pins that can bend or break during replacement. The ORP electrode also has an extendable cloth junction. This type of junction allows for the renewal of the junction by simply pulling out 3 mm (1/8") to clear any clogging which improves measurement response time and stability. The exposed stainless steel temperature probe on this meter facilitates a faster, accurate temperature measurement. - Protects the internal electronics of the meter from an ingress of water in the event that the meter is dropped into a tank or a body of water. - HI98120 features a stability indicator tag on the LCD that will disappear once the reading stabilizes. - An electrode last approximately one to two years. It is possible to replace just the electrode and not have to buy a completely new meter. - The HI73120 ORP electrode is a simple cartridge design allows the sensor to be easily replaced whether in the lab or in the field. - Allows the reading to be frozen so that the reading can be documented. - The meter automatically turns itself off after 8 minutes of use in order to conserve battery life in the event the meter is accidently left on. - When the meter is turned on the battery % level is displayed as a percentage. Ordering Information: HI98120 (ORP) is supplied with HI73120 ORP electrode, HI73128 electrode removal tool, batteries and instructions.